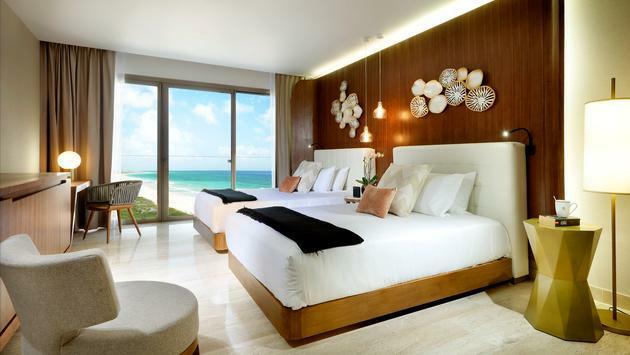 If you're looking for a quieter place to vacation, these two resorts in Cancun’s vibrant Hotel Zone are geared toward Millennials looking to escape the crowds of Cancun. Your clients love Cancun’s vibrant Hotel Zone for the white-sand beaches, huge variety of restaurants and nonstop activity. But vacationers who want to be close to the action while staying in a somewhat quieter spot should consider Costa Mujeres. This emerging area is home to two new, luxury all-inclusive resorts from the Palladium Hotel Group—the Grand Palladium Costa Mujeres Resort & Spa and the TRS Coral Hotel. They’re geared toward Millennials looking to escape the crowds of Cancun. Here’s what you need to know to sell both. The luxury, 673-suite all-inclusive has all the bells and whistles that well-traveled Millennial families want, including seven themed restaurants and a 24-hour sports bar among its several top-notch watering holes. The Family Selection at Grand Palladium Costa Mujeres Resort & Spa offers families secluded suites, a private pool, restaurant and a private section of the beach. This category of room also comes with priority reservations, free laundry service and special surprises like cookies-and-milk turndown service for children and freshly made baby foods. Sports enthusiasts will want to know about the Rafael Nadal Tennis Centre, which is located on property and is the first outside of the champion’s hometown of Mallorca, Spain. The Centre will offer personalized programs for all ages and levels, conducted by coaches of the Rafael Nadal Academy by Movistar and developed by Nadal and his technical team. The resort’s Zentropia Palladium Wellness & Spa offers therapies from around the world, including Finnish saunas, Himalayan salt wraps, open-air clay mud masks and a stone foot shower. The spa features a hydrotherapy circuit with a recommended path for guests to best enjoy each pool or water treatment. Guests can also book time in the saltwater Flotarium. 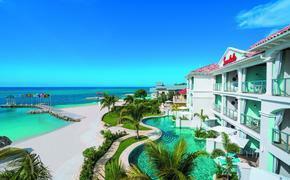 The new TRS Coral Hotel is the ideal complement to the Grand Palladium Costa Mujeres Resort & Spa. All-inclusive, adults-only TRS has a cozy vibe, and its 473 suites include high-end amenities like butler service, hydro-massage baths and Nespresso machines. Some suites come with swim-up terraces. TRS Coral guests also have complimentary access to the hydrotherapy areas of the spa and wellness center, and access to an exclusive pool and a private section of beach. In addition to the restaurants offered at the Grand Palladium property, some of the TRS Coral’s top dining experiences include an Ibiza-inspired beach club and a cabaret-style dinner show at Chic Cabaret & Restaurant.